I don’t know about you, but I find that Instagram stories is a super fun place to not have to worry about the overall aesthetic of my Instagram feed. Although if you were to go take a look at my profile, you’d notice that I’m not really a stickler for the uber curated Instagram feed. Yes I like my feed to look pretty, but I do NOT obsess over it and you’ll certainly see my fair share of selfies, puppy and baby pics mixed in with some business stuff as well. That’s just who I am, so I’m embracing the imperfectness of it ☺ I encourage you to do the same. Don’t be overwhelmed and certainly don’t let that overwhelm prevent you from taking action. Just post away and if you want to create a more consistent and aesthetically cohesive look to your feed as you go, you can certainly do that. Now, let’s talk Instagram Stories. 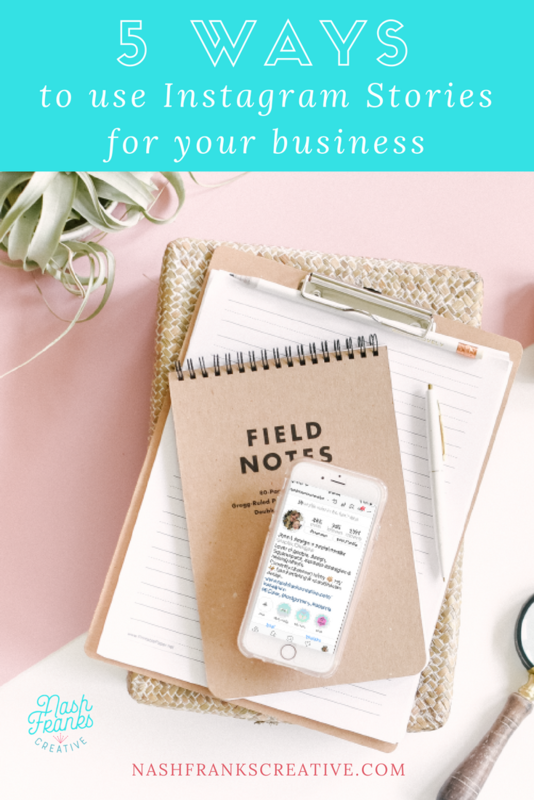 I’ve had several recent clients ask me how they can use Stories for their business accounts so I came up with 5 ways to use Stories for your business. Plus I have a bonus video that shows you how to create a fun cover photo for your Stories Highlights on your Instagram profile. Behind the Scenes/Sneak Peaks - everyone love to peek behind the curtain. Don’t you remember the wizard of Oz?!? Some things that you could share are: you making whatever it is you make, upcoming projects, some of your finished client work, photos/video of you doing your thing, your work space…etc. The personal side of the business - with Instagram stories you don’t risk “messing up” your curated feed with photos of you wearing no make-up, poor lighting, crazy fun silly animated GIFs, or fun face filters. So don’t be afraid to talk right to your audience, use those fun GIFs and silly face filters. Share the personal behind the scenes footage. Do you work from home? Maybe give a tour of some other parts of your house. Maybe show fun dog videos or other parts of your daily life/schedule as you work & play. Other non-work passions - Do you love to volunteer? Do you love to read? Do you love hanging outside in your hammock 🙋🏼 then share these non-work related passions. Your audience is eager to know the personality behind the business, they want to know the person behind the brand. In a sea of other awesome designers, hairstylists, coaches, crafters, sewers, makers…etc. these could be the differentiators that nudge someone to hire you over someone else. Let’s say you are a designer with a passion for gaming and you are sharing this on your Instagram Stories. This shared passion with a potential client could be the deciding factor in their decision making process. Many people struggle with doing their amazing thing in what they consider to be a crowded market. They worry about doing what everyone else is doing, and how will someone choose amazing me over some other amazing person… well, I’m here to tell ya Amiga: THIS. 👆🏼 This is how someone might choose you over some other amazing person. Education - Start teaching people about the things you do in your business. You could teach actual business practices, how to sew, hair tutorials, design principles, writing, dog training... literally anything that you have knowledge of, you could share with your audience and teach them something. Take a poll - The Instagram algorithm likes when you use its built in features, plus a poll encourages engagement on your stories, which tells the algorithm that your content is obviously quality content because so many people are engaging with it. Unsure of what to poll your audience? You can literally poll them on ANYTHING. Give them a choice on a topic they might want you to talk about/teach. Which shoes should I wear? Where should I go for dinner? What’s your favorite beauty product? I’m not kidding when I say that you could create a poll around anything. Today I answered one that was about what topic they should teach. Plus from an audience’s stand point its super fun to click on your answer and then instantly see how it compares to everyone else’s votes. So there you have it! 5 ways to use Instagram stories for your business and create more engaging content for your audience plus have some fun while you’re at it! Even if you use social media for your business it doesn’t have to be all serious business. We can still have fun with it! Do you feel like you never know what to put in your Insta Stories? Are you avoiding using stories because you don't want to put on make-up or have poor lighting? Do you think it will take too much time to post AND do Instagram Stories? If this is you.. Join me in a LIVE Instagram Workshop on March 22nd!